Students from around the world choose to study in Illinois. Between Chicago's latest expansion of O'Hare International Airport, hundreds of global companies and the fact that the city's economy is the 17th largest in the world, there is no doubt the Second City is force on the world stage. But the best Illinois window on the world is far from the big city. It's on college campuses around the state. Illinois ranks No. 5 among the U.S. states with the most foreign students, according to Educational Exchange Data from Open Doors 2017. The number of students increased in 2017 by 3.8 percent, bringing the total number of international students in the state to 52,225.
International students come to Illinois from around the world, with 32.5 percent of those students hailing from China, 25.8 percent from India, 6 percent from South Korea, 2.8 percent from Saudi Arabia, and 2.1 percent from Canada. The Brookings Institution reported in 2014 that the greater Chicago area ranked No. 6 among 118 metro areas in the U.S. as a destination for international students. American students in Illinois are also going abroad, with just over 9,000 students enrolled in Illinois institutions learning. The institutions around the globe with the highest number of foreign students is far and away the University of Illinois at Urbana-Champaign with 12,454 students enrolled in the 2016-2017 school year. The university is ranked No. 2 among all public higher education institutions nationally for the number of international students enrolled. University of Illinois has more than 400 collaborative agreements with education institutions in 60 countries. Each of these agreements works in tandem with one of the university's colleges or departments and seeks to grow the mobility of students, faculty, staff and peers. The university has been a top producer of Fulbright U.S. Student Awards for the seventh time in the last 8 years. The Fulbright award is the U.S. government's flagship international education exchange program. Northwestern University in Evanston has more than 5,000 international students, with approximately 35 percent of those coming from China. One out of 10 students in the 2020 graduating class at Northwestern is from outside the U.S. According to the university, the top academic programs for undergraduate foreign students include economics, industrial engineering, computer science, journalism, communication, mechanical engineering, mathematics, chemical engineering and political science. On the master's degree level, foreign students are more focused on engineering and computer science. The University of Chicago in Hyde Park also has a large international student base and enrolls more than 3,900 international students from more than 100 countries. American students are also able to take the opportunity to explore other cultures through its study abroad program. Currently, 48 percent of UChicago's undergrad students participate in the program studying in 32 cities in Europe, Asia, Africa, Latin America and the Middle East. "Through their experiences abroad, college students develop new lenses through which to see and reflect upon not just their academic subjects, but also themselves," said Sarah Walter, associate dean for international education and director of study abroad. "These opportunities give students a more diverse worldview and broader perspective that help them contribute to solving local and global challenges." International students bring a wealth of diversity and cultural understanding to college campuses. The opportunities to learn from one another benefit both domestic and foreign students­­ — which in turn benefits their eventual employers. According to the Pew Research Center, of the 13,600 foreign students who studied in the Champaign-Urbana area and worked or sought employment through the U.S. Optional Practical Training (OPT) program between 2004 and 2016, 45 percent stayed in the area. Of the 54,300 foreign students in the Chicago-Naperville-Elgin metro area, 68 percent stayed to work in the area they study through the OTP program. 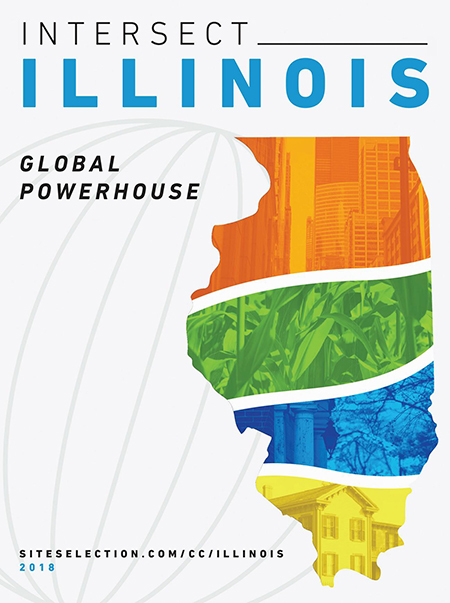 There's only one place where business and opportunity intersect on a global scale — Illinois.